Winter 30x30, and selfie attempts. In my head, I've been doing an approximate 30x30 since summer. But I haven't documented nor counted anything. In the spirit of having fun, and needing a tad bit of a diversion, I'm challenging myself to document my favorite 30ish pieces for winter, and to consider purging the rest. The limitation to a smaller number of pieces that I've discovered so far is laundry. There's times I wear something I don't love simply because what I do love isn't clean yet. 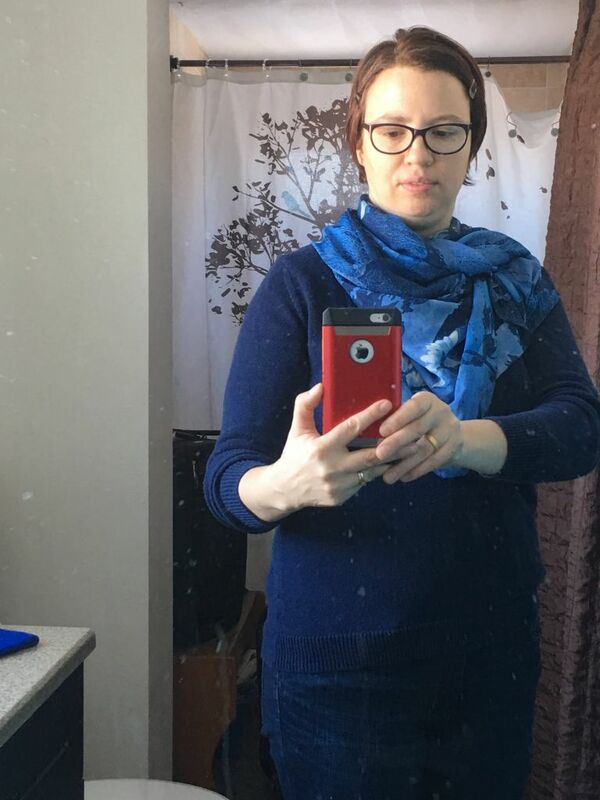 Today, though, what I love is clean, so I decided to try for a photo of my current favorite FFB outfit: perfect jeans (the lemming ones from WHBM), navy sweater and interesting scarf. I'm comfortable in this casual outfit - it feels just pulled together enough. I'd eventually like a different navy sweater for this sort of combo, but haven't found the right one yet. Honest feedback is invited - and suggestions for improvements (including selfie-taking with a phone improvements). Thanks you all!